This month's recipes come from members of the National Federation of the Blind of Delaware. 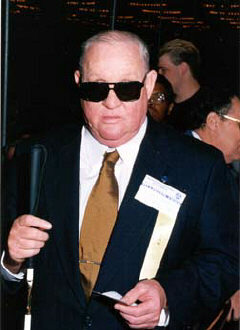 Richard Bennett is the President of the NFB of Delaware. Method: Chop cabbage and boil until tender. Cook package of noodles according to package directions. Finely chop onion. Melt butter in large frying pan or wok. Saut� onions and cabbage until lightly browned. Add cooked noodles. Serves eight. Method: Using an electric mixer, beat eggs, milk, and seasonings for five to six minutes. Melt butter in a large, heavy pan or double boiler. Add egg mixture. Cook slowly and stir constantly until mixture is thick and looks like scrambled eggs in cloudy water. This takes about a half hour. When the mixture arrives at this stage, pour into a colander lined with cheesecloth or muslin. Gather edges of cloth together and twist to squeeze excess liquid from egg mixture. Let this bag hang for several hours. Mixture inside will dry and form a ball. When dry, peel away material and refrigerate cheese ball until ready to slice and serve on crackers or bread. Makes a six-inch ball. Method: Thinly slice cucumber into a bowl and salt lightly. Mix sugar, vinegar, and water. Pour over cucumber slices. Chill at least one hour. Drain before serving. Top with sour cream and chives. Ada Stokes is the wife of Ed Stokes, a lifetime member of the NFB of Delaware. Cooking is one of her favorite hobbies. Method: Beat eggs thoroughly. Add flour and sugar, mixing well. Stir in pineapple. Pour into 1-1/2-quart baking dish and place diced bread on top. Drizzle with melted margarine. Bake at 350 degrees for forty-five minutes. Method: Mix brown sugar and honey in a pan. Pierce the ham with a fork and place in the pan, spooning honey and brown sugar mixture over all surfaces of the ham. Refrigerate for at least twenty-four hours. Preheat oven to 350 degrees. Ham may be studded with whole cloves, and rings of pineapple may be placed on top if desired. Bake uncovered for one hour if three pounds, and one and a half hours for a five-pound ham. Let stand for approximately fifteen minutes before slicing. Method: Brown beef and add tomatoes, onion, and celery. Stir until well mixed. Place a layer of cabbage on bottom of greased two-quart casserole. Spoon layer of meat mixture over, then add another layer of cabbage. Continue alternating layers, ending with cabbage. Sprinkle bread crumbs over top. Bake uncovered one hour at 350 degrees. Method: Mix all ingredients except the cabbage; then add it and stir gently to coat it thoroughly. Pour into mold. Chill. Serves twelve.